Two firsts of their kind—the cricket-rearing facility of Big Cricket Farms in Ohio and the original cricket-bar manufacturer Chapul in California—are leading the revolution to mainstream entomophagy for consumer and world health. Most food companies are concerned with insects as adulterants in the products they produce. But a new wave of food products is intentionally including insects and labeling them as a key ingredient in the food. To expose the industry to this evolving food option, this QA Profile focuses on the breeding and manufacturing of insects as human food, its founding as a sustainable food option, the food safety and quality aspects of these unique products, and the challenges of overcoming the Western “Yuck Factor” to turn these sustainable foods from trend to mainstream. 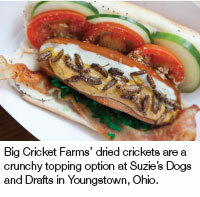 To get to the meat of the story (so to speak), QA Editor Lisa Lupo toured Big Cricket Farms, the first U.S. edible-insect farm; visited with the founder of Chapul, the manufacturer of the first U.S. commercial insect-flour product; and, yes, had her first bite of crickets—both crunchy whole and as a protein-rich ingredient.